Rhubarb and Strawberries were meant for each other. It’s a marriage made in “flavor combination heaven” The flavor combination is wonderful and delicious. 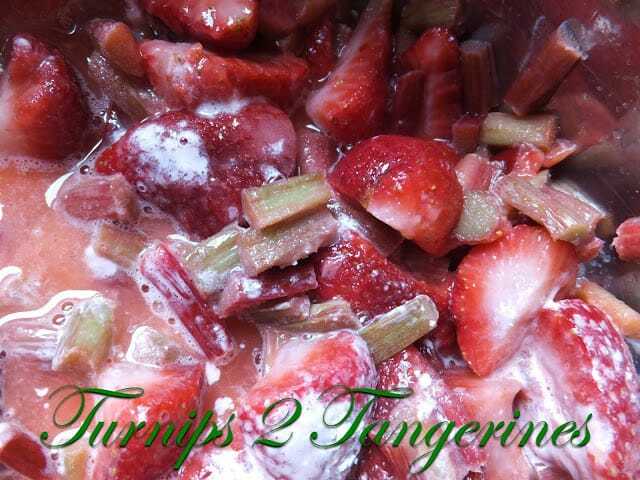 Rhubarb adds tartness, while the strawberries add sweetness. When using both fresh rhubarb and fresh strawberries this duo is unbeatable. 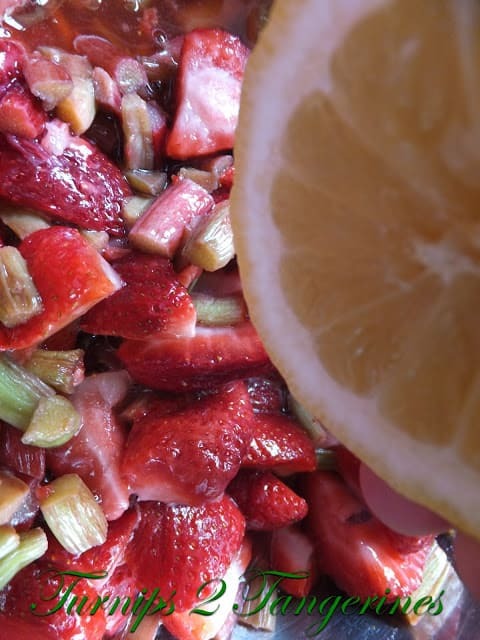 In America, this popular flavorful combination is well known and much loved but in Britain, rhubarb and ginger is a traditional flavor combination. 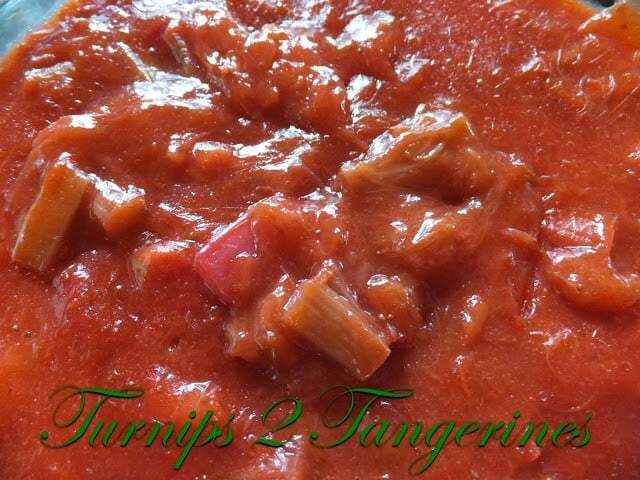 Rhubarb-Strawberry or usually called Strawberry-Rhubarb is more popular now than ever. My favorite, Strawberry-Rhubarb yogurt by Noosa Yoghurt. Rhubarb-Strawberry filling adds that special touch to these bars and also in this recipe for: Rhubarb-Strawberry Coffee Cake. After learning that in Britain the popular flavor combination of rhubarb and ginger is “king” I am more than curious to find out for myself. Next spring when rhubarb is in abundance at my favorite farm stand, Nicolet Farms (they have the best rhubarb I’ve ever eaten, and I’ve eaten loads of rhubarb in my lifetime), I’m going to buy extra so I can whip up a batch of rhubarb/ginger. Keep your eyes peeled for a recipe using this flavor duo. In a medium bowl, combine the flour, oats, brown sugar and baking soda. Using a pastry blender, cut in shortening until mixture resembles coarse crumbs. Stir in 1/2 cup chopped nuts. Reserve 1 cup of crumb mixture for topping. Press remaining crumb mixture into the bottom of prepared pan. Evenly spread 2 to 3 cups rhubarb filling on top. Sprinkle with reserved crumb mixture and additional chopped nuts, if desired. Bake at 375º for 30 to 35 minutes or until the top is golden brown and filling is bubbly. In a medium saucepan, combine fruit and water, cook over medium heat for 5 minutes. Add fresh lemon juice and lemon zest to fruit mixture, stir. 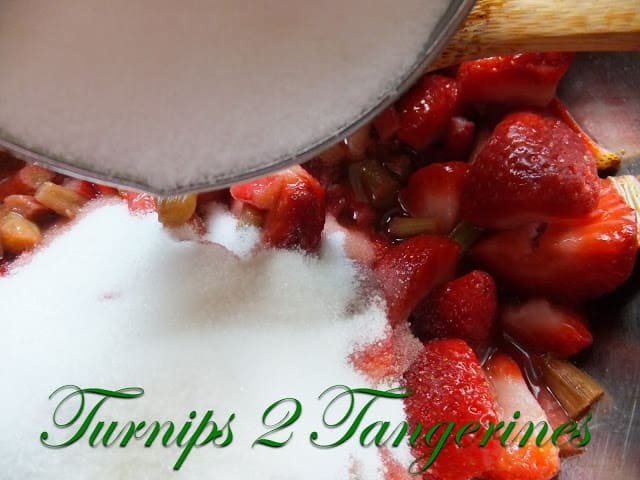 In small bowl, combine sugar and cornstarch; add to fruit mixture. Cook and stir 4 to 5 minutes or until mixture thickens and is bubbly, stirring constantly. 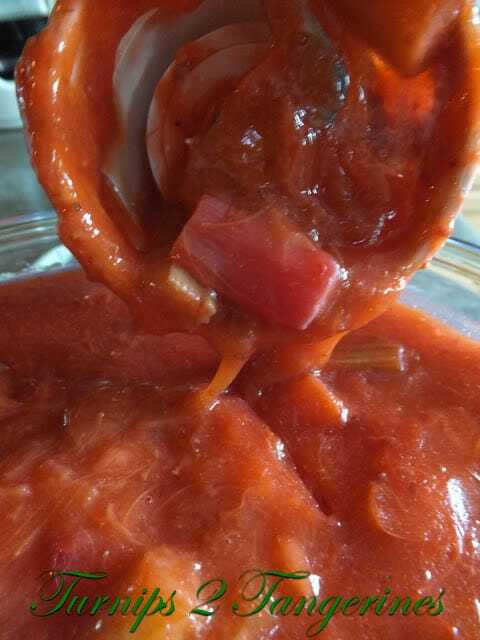 Remove from heat and cool slightly. Use an immersion blender to blend fruit into a filling consistency. Cool. I must say that these bars look and sound delicious!! 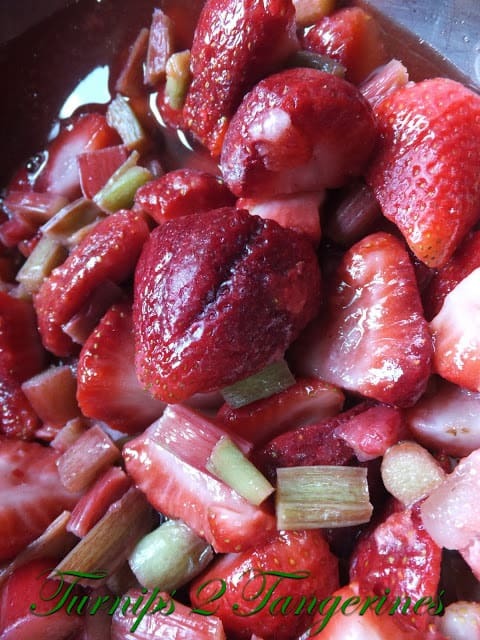 I just wish we had rhubarb here…..
Yum strawberry and rhubarb are so delicious together….these look great! LOVE LOVE LOVE the RHUBARD AND STRAWBERRY COMBINATION. Thanks for these great recipes.